Today we’re excited to announce some improvements to our Social Sharing addon. We’ve added a bunch of options that will help you save time, reach a wider audience, and boost engagement on social media. We’ve also improved our Automatic Layout option to drastically speed up your gallery load times. 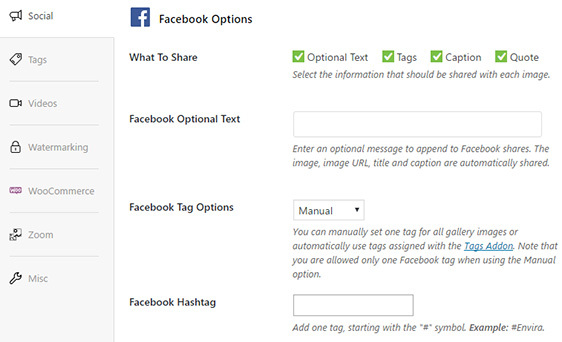 We’ve added a ton of new options and features to our Social Sharing Addon. We’ve added several new Facebook specific options that will help you to save time, look more professional, and reach a wider audience. You can now specify default text for your shares. This will help you to look great on social media, even if your users can’t think of the right words to say about your photos. And with today’s update, you can also choose to connect to our Tags Addon to automatically share any Tags assigned to gallery images. This will help you to reach a wider audience on Facebook by using relevant keywords. You can now enable Rich Pins on your galleries! Pinterest allows 6 types of Rich Pins: app, movie, recipe, article, product and place. This will help you to grow your business on Pinterest by boosting your clicks and sales. Also, we added the option to select a Pinterest sharing type. Your users can either pin the one image selected, or choose from all available images to pin. 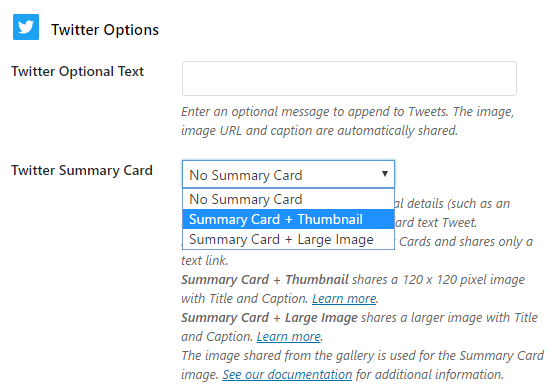 With today’s update, you can now enable Summary Cards on Twitter. Your summary cards will increase clicks and engagement by giving the reader a preview of your content before they click through to your website. They can be used for many kinds of web content, from blog posts and news articles, to products and restaurants. You can now specify default text for Google+ shares. Instead of relying on your visitors to come up with enticing text, you can suggest your own. We’ve also made some behind-the-scenes technical upgrades to improve your Instagram galleries! Important: The new and improved Instagram update means that Instagram Addon users must re-authorize the integration. Here’s how to enable and authenticate Instagram. We’ve always prided ourselves on being the fastest WordPress gallery plugin. Now, we’ve added performance improvements for our Automatic Layout to load even faster. With this update, you’ll notice drastically reduced load times for your galleries using the Automatic Layout option. The Instagram add on just displays images though, it doesn’t enable sharing of them. What are the changes you have made? You’re absolutely right Dan! I updated the post to clarify the confusing wording. Thanks for pointing that out. The improvements on the Instagram addon are all behind-the-scenes updates to the code to make the addon more efficient, so you won’t notice a difference in your dashboard at all.